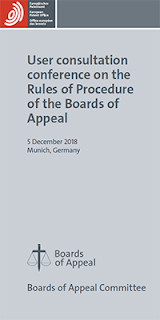 At the "User consultation conference Rules of Procedure of the Boards of Appeal" in Munich on 5 December 2018, users of the system the opportunity to hear presentations by members of the Boards of Appeal on the revised draft, followed by panel discussions by members of the Boards of Appeal Committee, the Boards of Appeal and representatives of user associations. A first public draft of the RPBA was subject to an online user consultation procedure in early 2018. In light of the responses received, the second version was drafted, including newly introduced provisions on case management. This revised draft of the Rules of Procedure of the Boards of Appeal (RPBA) was agreed upon by Boards of Appeal Committee (BOAC) and the President of the Boards of Appeal, and formed the basis for the conference. The revised draft shows major changes to case management issues as well as to Article 12 "Basis of appeal proceedings" and Article 13 "Amendment to a party's appeal case" of the RPBA, which may change the rules of the game (jn appeal and in first instance as well!) as of 2020. Today, 14 December 2018, a report on the user consultation conference was posted on the website of the Boards of Appeal. The report can be found here and is shown in full below. On 5 December 2018, the Boards of Appeal Committee (BOAC) and the President of the Boards of Appeal jointly hosted the user consultation conference on the current revision of the Rules of Procedure of the Boards of Appeal (RPBA). The purpose of the conference was to present and discuss the latest public draft of the revised Rules of Procedure dated 25 October 2018, which incorporates further changes to the text of the Rules and the accompanying explanatory notes, introduced in the light of the online consultation held in the spring of 2018. The conference was attended by around 140 participants, who were mainly representatives of various user associations (including epi and BusinessEurope) and patent attorneys. In his welcoming address, Mr Roland Grossenbacher, Chairman of the BOAC, described the aim of the revision of the RPBA as being to improve the appeal procedure in terms of predictability, consistency, efficiency, legal security and duration. Other aspects to be taken into account were the efficiency of the procedures before the EPO as a whole and the need to guarantee the fundamental right of the parties to fair proceedings. The President of the Boards of Appeal, Mr Carl Josefsson, also welcomed the participants. He emphasised that the amended Rules of Procedure will have a substantial and significant impact on the users of the patent system, the Boards, and the procedures before the EPO as a whole. Therefore it was very important that thorough and in-depth discussions, in particular with users, should take place. Mr Josefsson also noted that the online consultation earlier in the year had brought in hundreds of pages of very valuable comments and suggestions. The conference, which was moderated by Sir Colin Birss, member of the BOAC and Justice of the High Court of Justice of England and Wales, was divided into two parts, each consisting of a PowerPoint presentation by a Board Chairman, a panel discussion and a question and answer session between the audience and the panel members. The first presentation, given by Mr Marcus Müller, Chairman of Technical Board of Appeal 3.3.02, concerned the newly introduced case management measures, which are as follows: planning of cases for the coming year - new Article 1(2); designation of board members / tasks of rapporteur - new Article 5; consolidation and acceleration of proceedings - new Article 10; case management before oral proceedings - new Article 15(1); changing the date of oral proceedings - new Article 15(2); remittal to department of first instance - new Article 11; abridged reasons in decisions - new Article 15(7) and (8); case management after oral proceedings - new Article 15(9). The second presentation, by Mr Mike Harrison, Chairman of Technical Board of Appeal 3.2.06, dealt with the proposed changes to the provisions regulating the "core" of the appeal procedure, Articles 12 and 13 RPBA. The focus here was first on the basis of appeal proceedings and amendments made in relation to proceedings before the department of first instance - new Article 12, and then on amendments to a party's appeal case - new Article 13. He also explained the transitional provisions. The panellists at the event were Dr Klaus Bacher, member of the BOAC and Judge at the German Federal Court of Justice, Board of Appeal Chairmen Mr Marcus Müller, Mr Mike Harrison, Mr Ingo Beckedorf and Mr Roland Bekkering, as well as Mr Chris Mercer and Ms Heike Vogelsang-Wenke on behalf of epi and Mr Francesco Marchetta and Ms Bettina Wagner on behalf of BusinessEurope. In his concluding remarks, Mr Josefsson expressed his appreciation for the open and useful discussion and exchange of views that had taken place. He informed participants that, as a next step, the BOAC and he would consider whether any final adjustments need to be made to the draft in the light of the comments and suggestions made at the conference. Looking ahead, it is envisaged that the draft RPBA will be finalised and adopted by the BOAC in early 2019 and then presented to the Administrative Council for approval in the course of the year. In this way, the Rules of Procedure as amended may be expected to enter into force at the beginning of 2020.